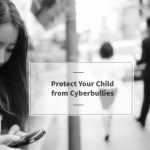 Home Most Recent Early Intervention Articles How Does My Parental Screen Time Impact My Child’s Development? 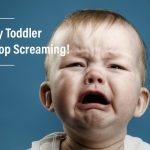 Your own use of technology, be it cell phones, desk top computers, lap tops, tablets or television is all screen time and your amount of screen time does have an impact on your child’s development. In a July/August 2018 issue of the Atlantic, titled “The Dangers of Distracted Parenting”, author Erika Christakis states that “When it comes to their children’s development, parents should worry less about kids’ screen time-and more about their own.” The more screen time we as parents engage in, the less emotionally available we are to our children. We may be physically present, but we are in effect “tuned out”. In 2016 the AAP suggested that kids ages 2-5 should have no more than one hour of screen time each day and kids under age 18 months should have NO screen time at all (the exception being video chatting via Skype which can be beneficial when for example a child has a parent overseas in the military). 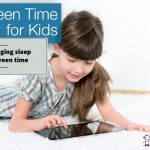 Screen time now does include the use of television, cell phones, tablets and computers. In today’s day and age many parents are finding it harder and harder to pull their children away from fast paced, colorful television shows, games and apps. On top of that, parents’ own time spent on Snapchat, Pinterest, Facebook, WhatsApp, Twitter and the like means that they are not interacting verbally or socially with their young children during their child’s critical stage for social, language, and cognitive development. 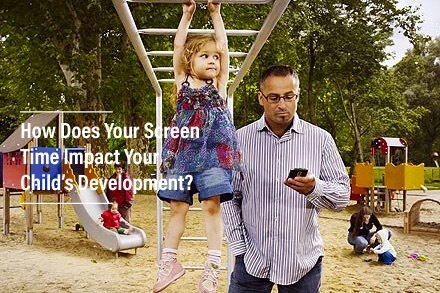 Quite a few recent studies indicate that parents’ and childrens’ screen time can and is affecting their development. While children enjoy and can learn through various educational TV programs and apps, limiting the usage time and engaging with your child socially while they are learning is of vital importance. For example, when your child watches Sesame Street, you should be watching with them, and commenting on what is going on during the show. When your preschooler is using an app on your iPad, you engage in the game with him, commenting on what he is doing “You added 3+2 correctly, that’s great work!” so that these screen time activities are social & interactive learning experiences, not just passive screen time. Passive screen time means handing your child your phone in order to keep her quiet in a restaurant, or having your child sit on the couch watching a 2 hour movie while you’re in the kitchen cooking dinner, or playing on your iPad. Sure there are times, when you NEED to placate your child or get something done, that’s parental reality, but do try to keep tabs on how often this is occurring. If this is happening daily or your child is engaging in upwards of 1-2 hours of passive screen time per day, it’s too much! One recent study found that “Each additional 30 minutes of hand-held screen time was linked to a 49 percent increased risk in expressive speech delay.” Birth to three is considered the “critical period” for a child’s brain development and too much screen time during this time can have lasting negative consequences according to Psychology Today. It is the way of the world now, every place you go people are incessantly staring at their mobile devices. In restaurants, at the zoo, at the beach, and while walking their babies in the park. We as adults go out with other adults and continue to stare at our phones in bars, restaurants, at church. Teenagers sit next to each other and text each other instead of speaking to each other. Socialization and emotional attachment are so important, but seem to be shoved by the wayside by these devices. It doesn’t have to be this way. 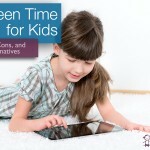 You are still ultimately in control of your screen time and your child’s screen time. You are your child’s role model. One study indicated that many parents spend as much as 9 hours per day glued to their phones and/or tablets, NINE HOURS! That makes you a pretty bad role model for your own children. Perhaps it is time to re-think your screen time and spend more quality time socializing with your family? Why not start today by making some household rules related to screen time use? Then be sure that YOU and all the other adults in your household model these screen time rules. For example, no screen time at family meals, no screen time when dining out at restaurants, no screen time on Saturday’s…be a good role model! And don’t forget the importance of face to face interaction, emotional connections and hands on PLAY for your children!